Now Aria and Perry are about to be reunited. It’s a moment they’ve been longing for with countless expectations. And it’s a moment that lives up to all of them. At least, at first. Then it slips away. The Tides don’t take kindly to former Dwellers like Aria. And the tribe is swirling out of Perry’s control. With the Aether storms worsening every day, the only remaining hope for peace and safety is the Still Blue. But does this haven truly exist? One of the best things about what Veronica Rossi does is that she keeps things pretty edgy and ‘real’ with giving us just enough of what we expect and then throwing us for a loop. What we get in this story is a relationship that’s meant to be but of course things can’t be that easy. I’m not just talking about Perry/Aria but of Roar and Liv as well. We know how things are among both couples, and you have to wonder if it’s enough. We are reunited with Marron in this tale which is really nice since he brought a level of sophistication to it all, and we get to know the guys that Perry met on his trip back to the Tides as well, which gives us the rough and tumble crowd. Brooke is featured in the sense that she’s our typical girl who’s jealous and completely unaccepting of a ‘dweller’ and that seeps out into a bunch of others. In this installment, we see Perry come into his own, and you get the sense that he’s much older than his 18/19 years. We come to have a new appreciation for Soren for any number of reasons (mostly because Aria’s mother let us in on a DLS secret), and we realize that Hess and Sable are even worse than we imagined. 1) Where’s the Still Blue and is Cinder (and his whole pod) the means to get in? 2) How is Roar going to continue on? 5) will Marron create some magical scientific thing to help save the Tides? so….can’t wait until Still Blue comes up on my list. enjoy reading! 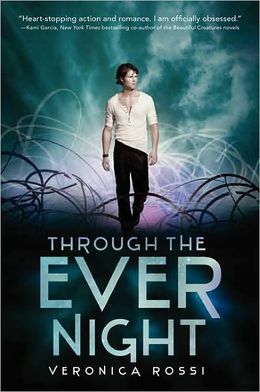 This entry was posted in Dystopian, fantasy, Reviews, Young Adult and tagged Dystopian, fantasy, Roar and Liv, Through the Ever Night, under the never sky, veronica rossi by iscm13. Bookmark the permalink.